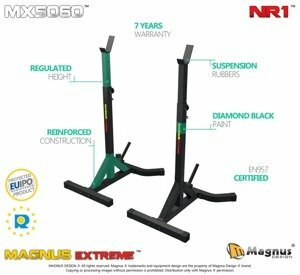 Magnus ® Extreme MX5060 barbell stands have height adjustments, reinforced construction, additional weight handle and rubber suspension elements. Ideal for squats with barbell and bench pressing exercises. 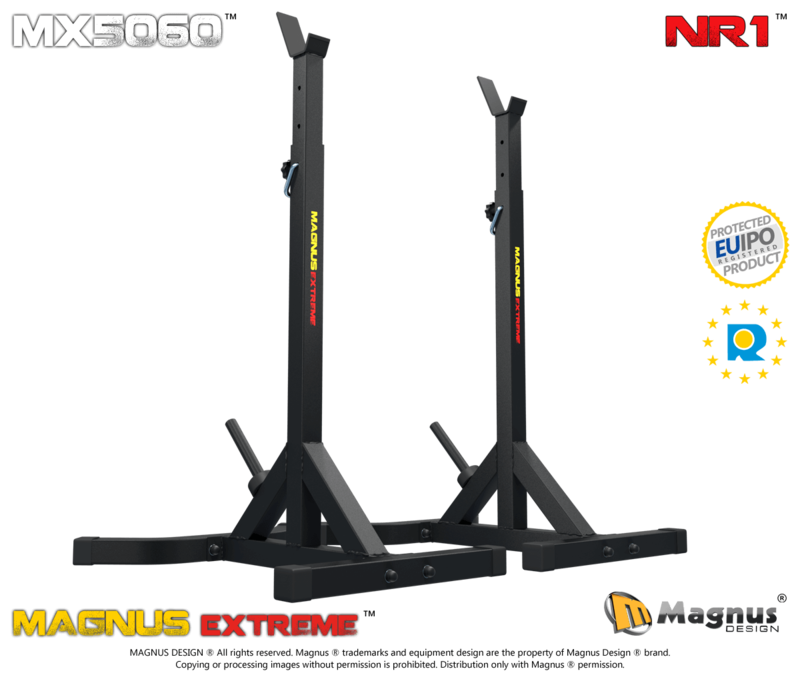 Check out the amazing new Magnus ® Extreme MX5060 training squat stands. MAGNUS DESIGN ® has created a new model that has been designed for great durability, unprecedented stability and maximum training capacity. So take a few minutes and discover exactly the advantages of professional MX5060 fitness stands. Keep reading and learn more Did you know that squat stands are the most common training tool, next to the training bench ? 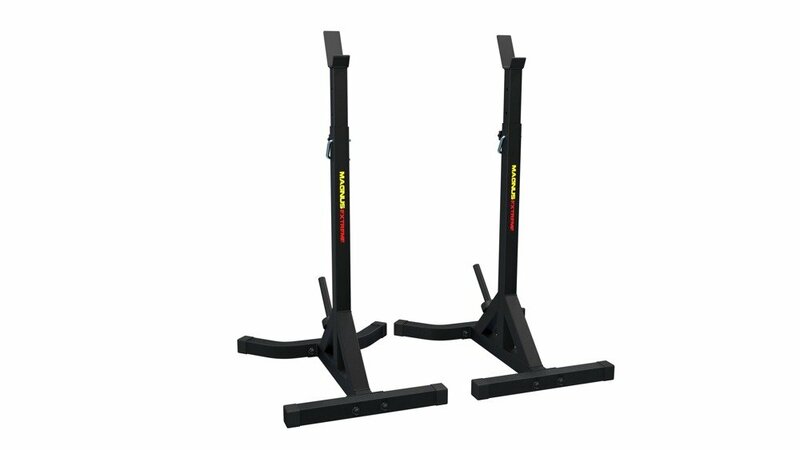 Actually two stand-alone training stands are useful for many exercises with use of straight or curved bar, as a necessary assurance of the exerciser. That's why solid squat stands are the foundation of the gym equipment and it's a good idea to choose the best and the strongest of them. It is because of them people beat world records in bench pressing or squats. They were used by the biggest bodybuilding champions like: Arnold Schwarzenegger - seven times Mr. Olympia champion, Ronnie Coleman - eight times in a row Mr. Olympia champion, or Jay Cutler - four times Mr. Olympia champion. So, training stands are necessary for anyone who dreams of a wide range of exercises leading to beautiful muscles and carved figure. So train with MX5060 barbell stands from MAGNUS DESIGN ® and achieve the desired results. 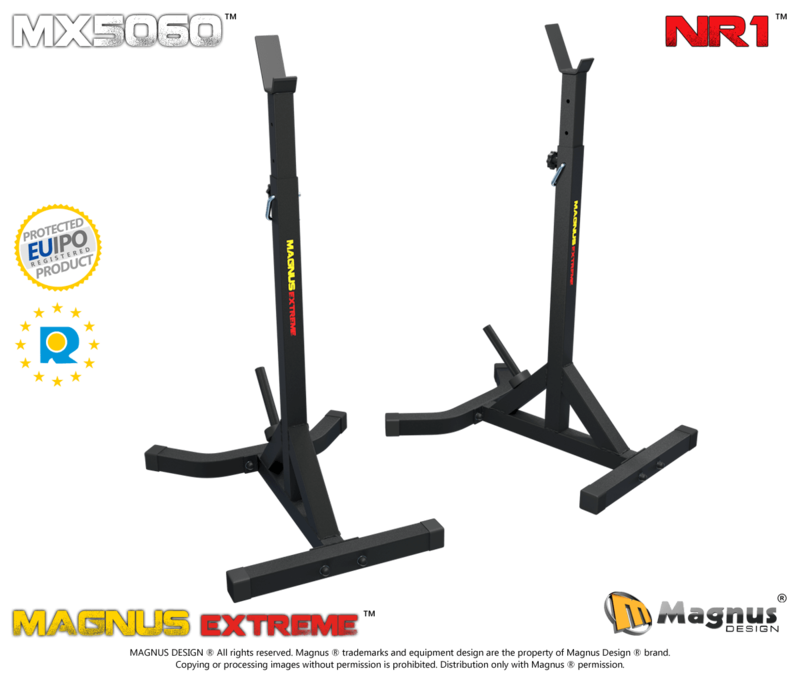 Why Magnus ® Extreme barbell stands ? What`s important ? Proper construction The MX5060 is not only impressive look. Behind that is a powerful 360kg durability and amazing training capabilities. 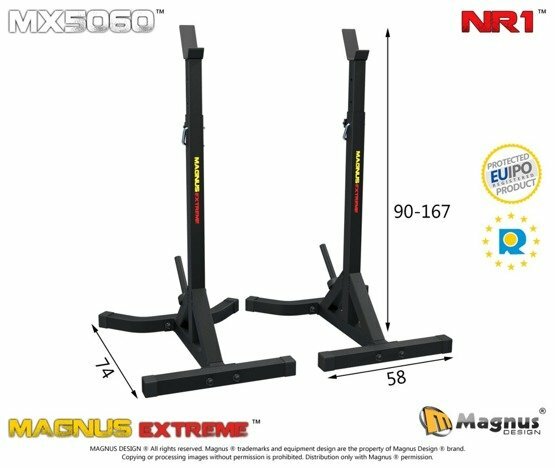 The Magnus ® Extreme series squat stands has achieved unprecedented levels of precision, unparalleled stability and finish quality. MAGNUS DESIGN ® designers, knowing the anatomy of the human body, set the settings so that, in spite of their growth, everybody can perform effective training. In addition, the risk of tipping the racks has been minimized by introducing a heavier and bent basis. Thanks to that, the training stands stand firmly and steadily taking over the load from the barbell. 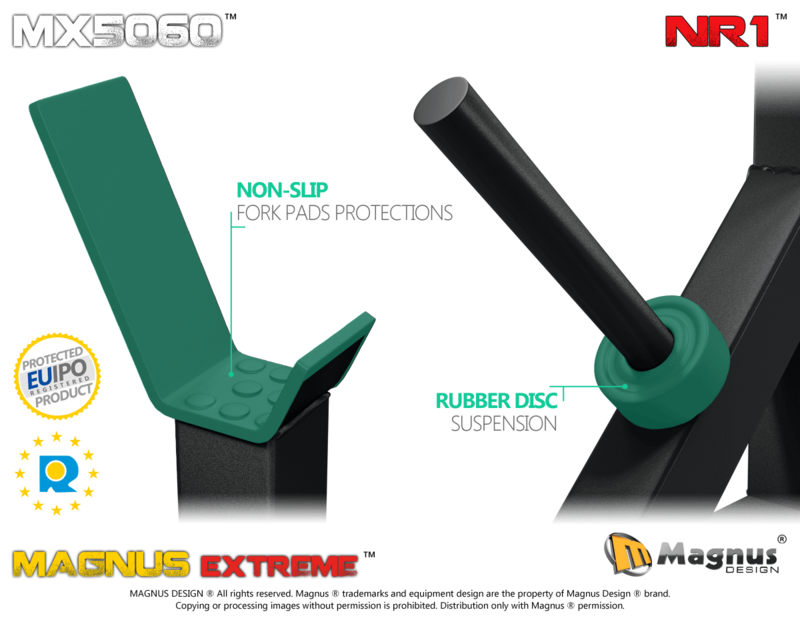 The MAGNUS DESIGN ® gym equipment is fully taking care of your safety. These include solid, certified materials used in production, as well as the proper size of construction, which together guarantee convenience and comfort during exercises. Convenience, comfort during exercises and your health Safety Barbell stands are a definite basis of the gym. And for MAGNUS DESIGN ®, the surest basis is your safety. 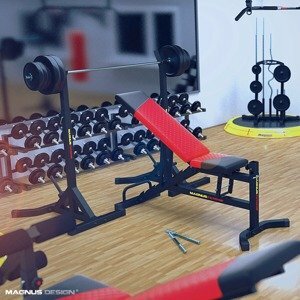 That's why the construction has been doubly reinforced and equipped with a wide bent basis, as well as a load-bearing handle that will keep you organized and you'll get even more stability during exercises. 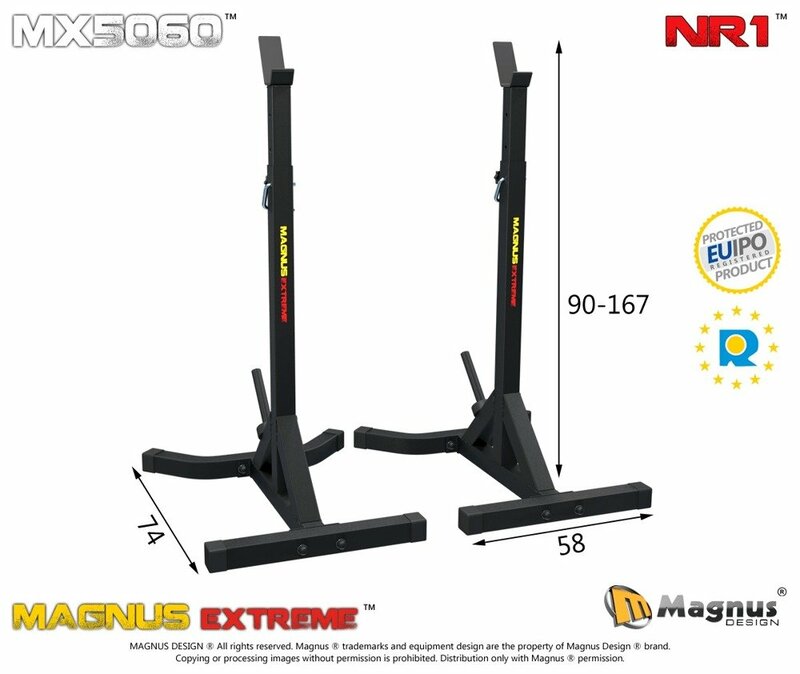 Choose the safest training stands Magnus ® Extreme MX5060, use equipment created by professionals. Take off and conquer. PS. 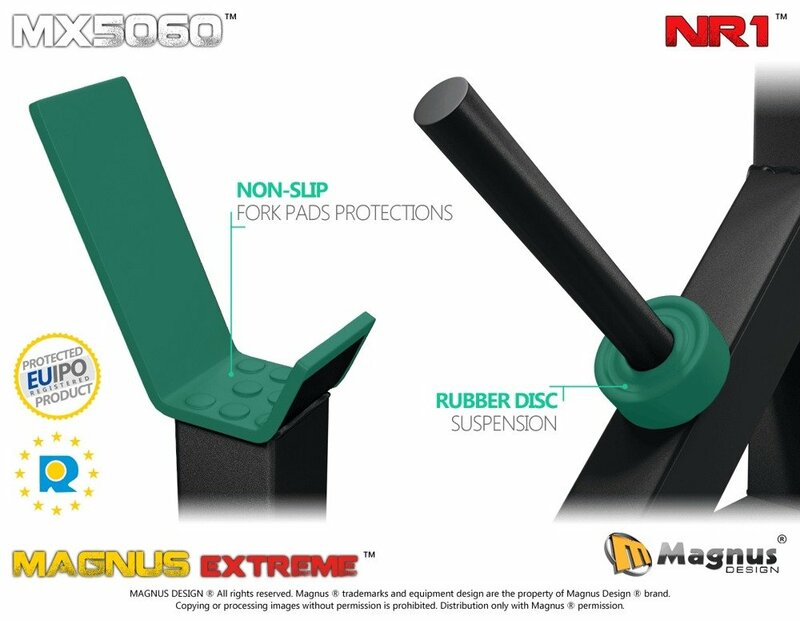 Do you want to practice safely and effectively with MAGNUS DESIGN ®, or treat injuries with others ? 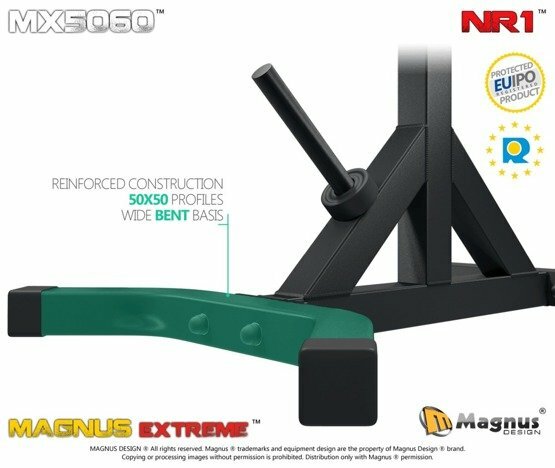 Technology of squat stands construction Ergonomics and aesthetics Notice how carefully thought-out the Magnus ® Extreme training stands construction is. 200% better stability and work confidence in compared to standard racks. Duble reinforced construction + additional handle. Suspension rubber on the weight handle. Suspension rubber on the fork. High quality of realization in Premium class, confirmed by certificate of compliance with EN957 standard. Stiffness of the structure guaranteed thanks to the use of pressure knobs. Outstanding aesthetics - all bolts with covers. Certified DC01 steel used for production. Perfect structural powder coating with the highest quality "Diamond Black" paint. Extended up to 7 years warranty on construction. 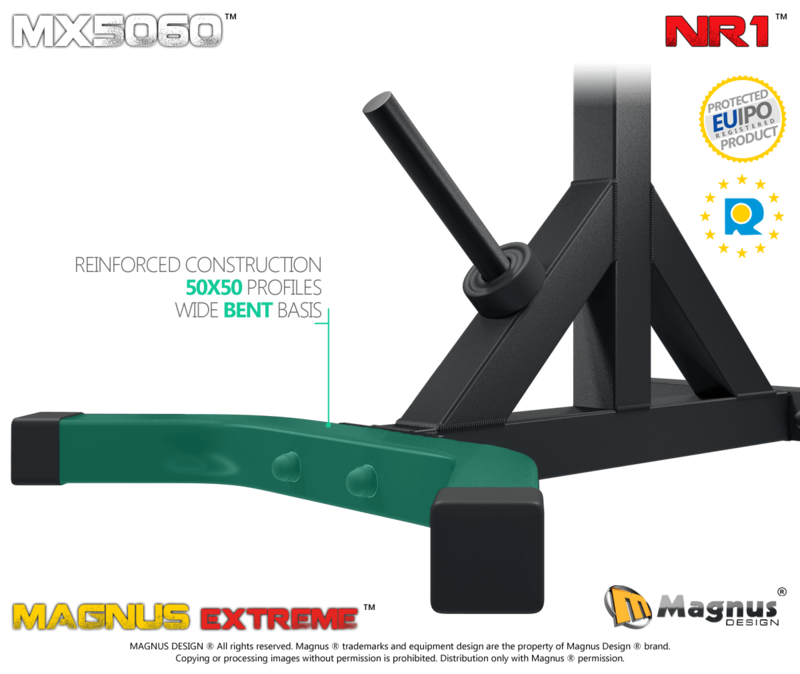 Durability Construction of a solid 50x50 profile The MAGNUS DESIGN ® team knows that heavy workout training requires even more powerful equipment. Therefore, the MX5060 barbell stands are appropriately reinforced, which creates an exceptionally strong construction. 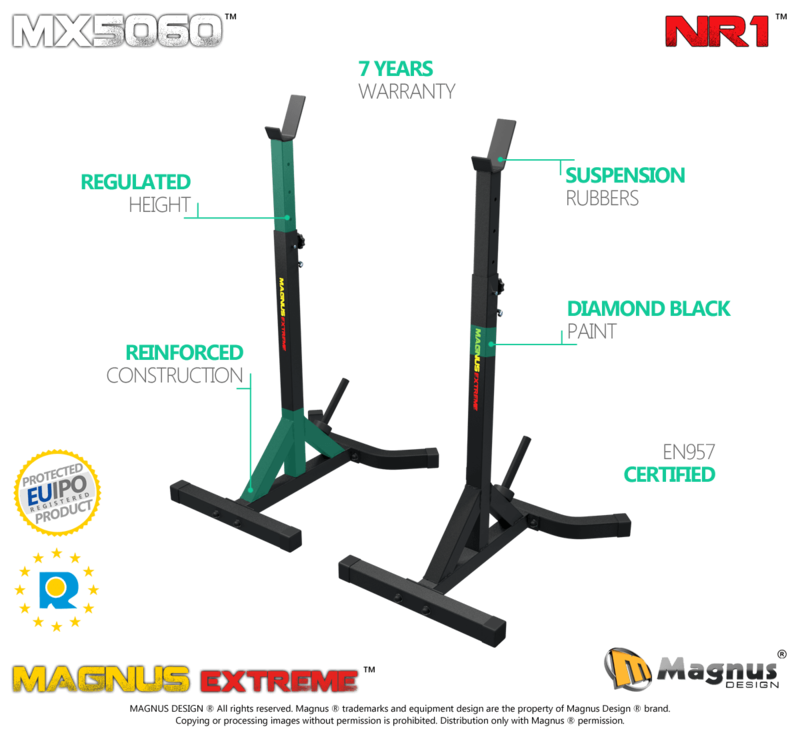 Magnus ® Extreme series of squat stands are known by very high durability due to the use of a certified profile with a cross section of 50x50. In addition, the reinforced construction and the bent wide basis guarantee great power and confidence in training with heavy weights. 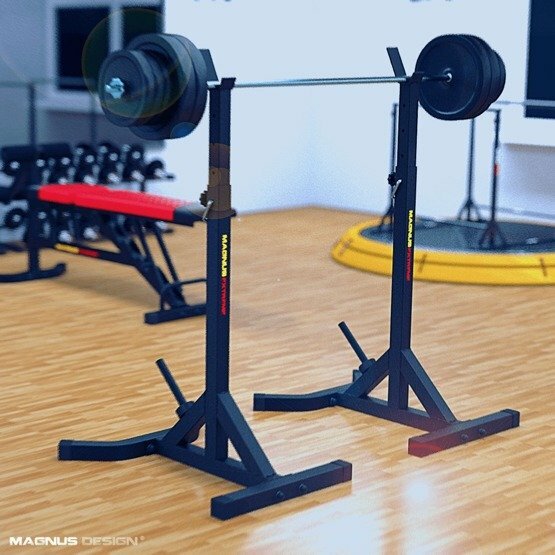 Trust the Magnus Design Team experts and choose the strongest squat stands for the gym. MAGNUS DESIGN ® experts are a team of athletes, physiotherapists and the best designers who know and understand the anatomy of the human body. 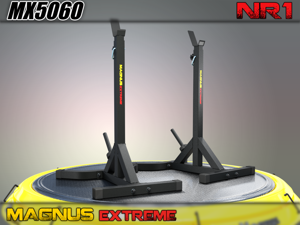 Therefore, choosing the MX5060 barbell racks you are sure to have the best equipment in the world. Sport equipment NR1. 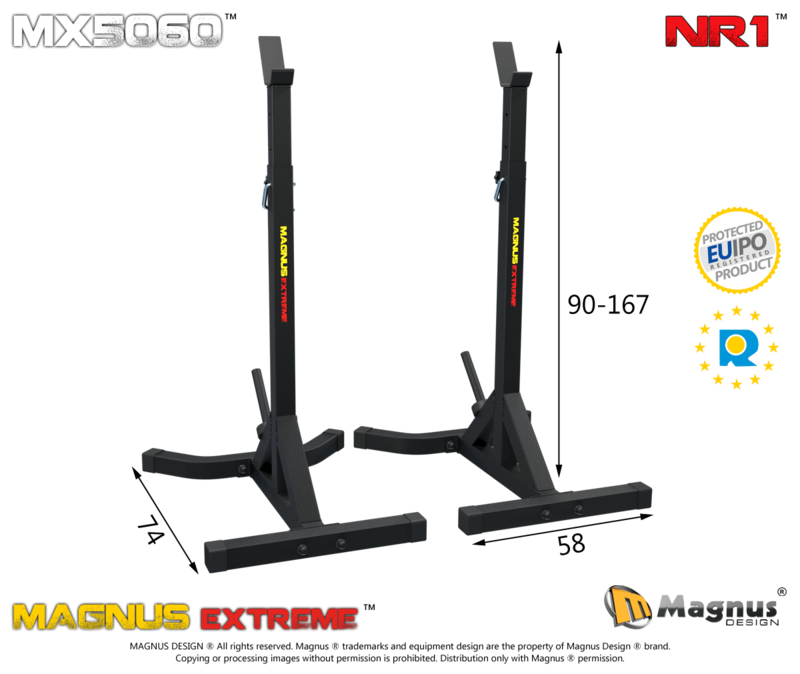 Diverse training Multi-functional equipment Magnus ® Extreme MX5060 adjustable squat stands are designed for a comprehensive workout. Check couple of exercises that you can do with them. PS. After doing heavy workouts, stretching exercises are recommended, such as a training stick overhang. Using that you should strive to relax the whole body. This relaxes the muscles of the back and restores the balance inside the intervertebral discs. Perfection by MAGNUS DESIGN ® Greatest Quality NR1 Magnus ® Extreme MX5060 are the best training stands. MAGNUS DESIGN ® is the world class sport equipment featured by diverse training and lifetime reliability. This is essence of knowledge and construction capabilities. Magnus ® Extreme squat stands stand out thanks to symmetrical super strong design, 4K welds technology, perfect structural powder coating "Diamond Black" paint and reinforcements of the construction. Our equipment is complemented by aesthetic finish, bolt covers and elegant branding. Right choice Satisfaction When choosing barbell stands you must remember that this is a training equipment subjected to heavy weights. Equipment to guarantee the best training range and - what is very important - full safety in 100%. Picture then different situation - you are going to climb on Mount Everest and you need a rope. Answer yourself this: which equipment should you choose - the cheapest or the best ? Think for a moment, would you risk your health by buying cheap i weak equipment, which does not meet any standards ? In Magnus ® we believe, that it is worth to invest in equipment, which will serve you for years, providing comfort of use and safety. Think, if you want to waste your money on the cheapest = worst equipment, or would you rather appreciate yourself and invest in the best equipment, which protect your health and take care of your safety. If you care about your health and full training capabilities, choose regulated barbell training stands MX5060 and join the MAGNUS DESIGN ® community, which achieve the intended goals.